Virginia: Virginia is by far the most popular tobacco type used in pipe tobacco today. About 60% of the nations tobacco crop is Virginia. Virginia is mildest of all blending tobaccos and has the highest level of natural dextrose (sugar), which basically gives it a light sweet taste. Virginia is used in virtually all blends, is a good burner and aids in lighting. Pure Virginia tobacco is best known from flake types. Dunhill's Light Flake is a very example. Medium in strength and rather sweet in taste. Several blends by Rattray comes into mind also. Marlin Flake being a rather heavy member of the family, but still very sweet. The Danish manufacturer A&C Petersen has the Blue Caledonian. Mild to medium in strength, and a nice pure taste of Virginia tobacco. Burley: Burley tobacco is the next most popular tobacco for pipe tobacco blending. It contains almost no sugar, which gives a much dryer and full aroma than Virginia. Burley is used in many aromatic blends because it absorbs the flavorings. Burley tobacco burns slowly and is a cool smoke, which makes it a nice addition to blends that tend to burn fast and strong. The technical term for Burley is "air cured". This air curing is done in large open barns, by the natural air flow, for one or two months. The color is ranging from light brown to mahogany. Pure Burley blends are mainly produced by U.S. and Danish companies. Blends like Blue Edgeworth, Old English and Half-and-Half are classic examples. The latter being slightly flavoured. Burley is also the main ingredient in most of the Danish McBaren blends. Spice tobacco: Spice tobacco is actually not one type of tobacco, but rather a broad variety of more special types, used in small amounts to create an interesting blend. These would include Oriental, Latakia, Perique and Kentucky among others. Most of them are frequently used in English blends. Oriental: A variety of tobaccos, grown in Turkey, the Balkans, and Russia. The best known types are Izmir, Samsun, Yedidje, Cavella and Bursa. A common characteristic is a dusty, dry and sometimes slightly sourish aroma. Some of them are also used in "exotic" cigarettes from Egypt and other Arab countrys. Latakia: Latakia is the result of a curing process involving fire curing the leaves over controlled fires of aromatic woods and fragrant herbs. Probably the most well known spice tobacco. Mainly grown in Cyprus and northern Syria. After the leaves are harvested and dried, they are hung in tightly closed barns and smoke-cured. Small smouldering fires of oak and pine fill the barn with smoke, and covering the leaves with smoke particles. Latakia produces a very rich, heavy taste, with an aroma that has a "smoky" characteristic . Latakia is an indispensable ingredient of traditional English mixtures. The content can vary from a few percent to about 40-50%, or even more. A few smokers like it at 100%. This would tend to be harsh, not because Latakia is a strong tobacco, but because it burns and tends to dry out your mouth and throat. Both Dunhill and Rattray have a number of blends that contain Latakia. Dunhill 965, Early Morning and London Mixture are from Dunhill, and Red Rapperee and Black Mallory from Rattray. Seven Reserve from Rattray has a moderate content of Latakia, and might be a good introduction to these kind of blends. 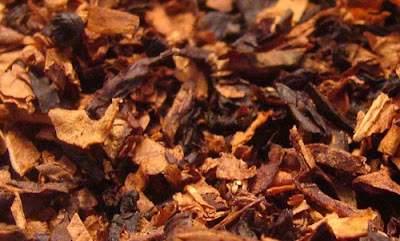 Bengal Slices is unique - a flake tobacco with a moderate to high content of Latakia. A very lovely blend if you like Latakia. Perique: Perique is a Red Burley type of tobacco, grown and processed in St. James, Louisiana near New Orleans. Perique is a rare, slow burning, strong-tasting tobacco. Production is small, so its value is quite high. Perique is cured like Burley, but for a shorter time. There after the leaves are put in large oak barrels or in Cypress logs under heavy pressure, which will squeeze some juice out and make the whole thing ferment. Once in a while the leaves are taken out for a period and then repacked and re-fermented. This process takes at least one full year. Some times even longer. The aroma of a tobacco treated by this method is full bodied. The nicotine content is overwhelming, thus Perique can not be smoked by itself. Due to its full-bodied nature, Perique is used on a limited basis in blends. About 5 % in a blend is the maximum. It is usually blended with Virginia to give it more body. Escudo is a good representative of a Virginia blend with Perique. Dunhill's Elizabethan Mixture is a very nice example of Virginia mixed with a touch of Perique. Kentucky: This is actually a specially treated Burley tobacco, produced in Kentucky. Unlike Burley, Kentucky is fire-cured. Its aroma is not as heavy as with Latakia, but very aromatic and unique. The nicotine content tends to be rather high, and therefor is used in limited amounts. Havana: Cuban and other cigar tobaccos are used in a limited range of Virginia blends and mixtures. Cavendish: Cavendish is more a method to treat tobacco than a type. English Cavendish uses a dark flue or fire cured Virginia which is steamed and then stored under pressure to permit it to cure and ferment for several days to several weeks. When done well, this tobacco is really fine stuff. Cavendish can be produced out of any tobacco type (mainly Virginia's and Burley's are used). The original English Cavendish is produced out of Virginia tobacco, which is slightly flavoured and heated by high pressure. This will give you a very dark, black tobacco. A few English Cavendish blends exist on the market - Rattray's Dark Fragrant and Black Virginia plus McConnel's Maduro. The modern version of Cavendish is generally much more flavoured. The natural taste of tobacco is almost gone. The flavouring is also called "Casting". This is the term used when you add a considerable amount of additives to the tobacco. This is usually done by producing a fluid mixture of sugar, liquorice or any kind of aromas in which the tobacco is soaked. The goal is to produce a sweet and smooth aroma. Modern Cavendish tobacco comes in numerous flavours, cherry, vanilla, rum, chocolate, strawberry, coconut .......and many other flavors. BLACK CAVENDISH. Most black cavendishes that form the base of many American-style aromatics are sweetened, stoved versions of certain burley tobaccos from Kentucky and Tennessee, as well as some dark air-cured tobaccos from central Virginia. The best have a caramel flavor, reminiscent of syrupy pancakes-mild, sweet, full-flavored but with a slight aftertaste similar to the burnt taste on toasted marshmallows. Air-Cured: These tobaccos are dried naturally, sheltered from sunlight in large barns. The drying is carried out on the whole plant or as individual leaves. Sugar is the by-product of this three month drying process. Dark Tobaccos: These tobacco plants are very mature and developed at the time of picking. The leaf is subjected to a second fermentation process. These leaves are used to make cigars. Fire-Cured: Akin to Dark, its natural drying is completed by a wood-fired fumigation (oak is used by the traditionalists). Sun-Cured: Almost all of Oriental Tobaccos are cured by this method. Oriental Tobaccos are grown in Greece, Turkey, Bulgaria and adjoining countries. What's up, constantly i used to check blog posts here in the early hours in the morning, for the reason that i love to find out more and more. yours. It's beautiful price sufficient for me. In my view, if all website owners and bloggers made excellent content as you did, the net will probably be much more helpful than ever before. What's Taking place i am new to this, I stumbled upon this I have discovered It positively helpful and it has helped me out loads. I hope to contribute & help other users like its helped me. Great job. educative and amusing, and without a doubt, you've hit the nail on the head. The problem is an issue that not enough men and women are speaking intelligently about. I am very happy I found this in my search for something regarding this. of comments here "Understanding The Blends". the responses appear as if they are written by brain dead visitors? :-P And, if you are writing on other online sites, I would like to keep up with anything fresh you have to post. Could you list of the complete urls of all your social pages like your linkedin profile, Facebook page or twitter feed? Thanks for finally writing about > "Understanding The Blends" < Loved it! Look at my blog members.